Size: 2.6" x 4.2" x 0.4"
The TI-2100 Pocket Info carries still the leading "TI-xxxx" characters. Later products got the "PS-xxxx" to indicate the "Pocket Solutions" marketing idea. This Databank stores 55 names and numbers in a credit card sized housing. 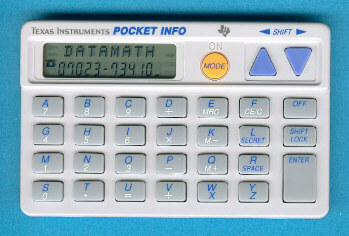 The TI-2100 roots back to the TI-2700 Mini Data Bank introduced in the year 1987 and was followed by the PS-2100. The internal construction of the TI-2100 is very similar to the TI-2400 Phone Bank.